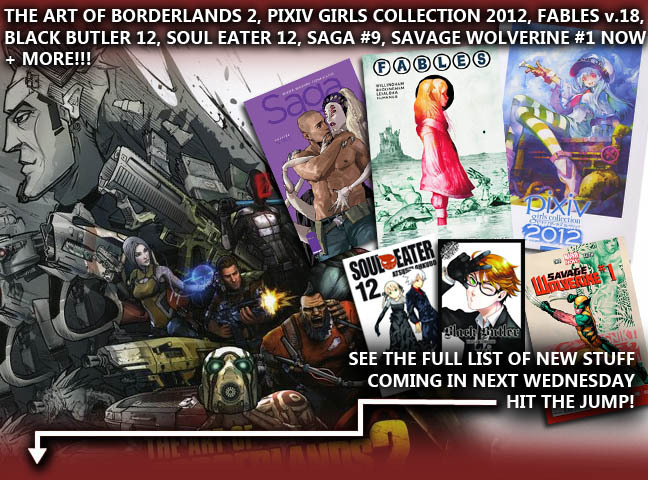 LABYRINTH BOOKS Toronto Comics MANGA and GRAPHIC NOVELS - TORONTO: NEW BOOKS ARRIVING NEXT WED JAN 16th!!! NEW BOOKS ARRIVING NEXT WED JAN 16th!!! - Fans of the video game Borderlands 2 ought to check out the awesome art book that's now available! - Pixiv fans really ought to check out the new 2012 Girls Collection, now in store! - Massive Black 2 featuring the fantastic concept art work of various top artists is a must see! - Lots of other new import art books are available right now! Artists looking for model reference can check out some of the new Japanese pose catalogues including one featuring couples and another on heroine action pose sequences! If you're looking for mecha robot reference, then the new 'Border Break' is chock full of it! And we have 'Students of the Round' collecting excellent fantasy character and monster designs! - Two new concept books on cars and motorcycles are available by Adrian Dewey and Harald Belker! - The new JUXTAPOZ magazine #145 is arriving this Wednesday featuring some new work by James Jean! - SAGA issue #9 arrives this Wednesday with a focus on The Will! - The first issue of 'Savage Wolverine' arrives this week where our hero finds himself hunted in the Savage Land! - Continuing directly from the recent Green Lantern: New Guardians Annual we follow disgraced Green Lantern Jediah Caul trapped in a deadly survival reality TV show! Check it out in the first issue of 'Threshold' arriving Wednesday! - FABLES Volume 18 arrives this week! Bufkin continues his adventures in Oz, while a new series of events begins to unravel when Snow and Bigby's daughter Therese receives an unknown Christmas gift! - Mark Grayson begins to regret his replacement, find out why in volume 17 of INVINCIBLE this Wednesday! - Fans of Eisner Award Winner Paul Pope have a new book to look forward to featuring a story of young lovers looking to run away, but not without ripping off the toughest street gang in L.A. + a selection of other unpublished rare work of Paul Pope's from the 90's alongside a manga he created for Kodansha now printed here for the first time! Grab your copy of 'ONE TRICK RIP OFF + DEEP CUTS' when it becomes available this Wednesday! - How do you like your inflatable Daleks? Small? Or LARGE!!! Or perhaps you'd prefer some English tea? Then why not get a Tardis Teapot? Perfect for any Dr. Who get-together marathon!